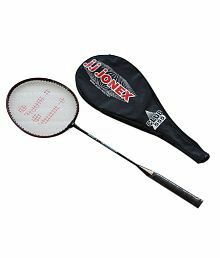 Here are top selected products for "Badminton"
A good set of badminton equipment can really highlight the true potential of a sport person. Items such as a racquet and a shuttlecock are of course, a must for any badminton player. 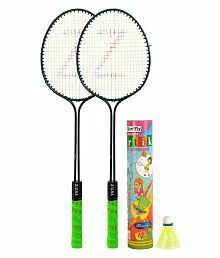 Apart from those accessories, it is necessary that a badminton player have good badminton shoes in his or her kit. 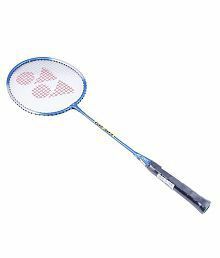 Badminton players do a lot of running, twisting, turning, and lunging on the court, for which they need good quality shoes. Badminton shoes should have a thin but well-supported sole. They should also be lightweight for faster movement. 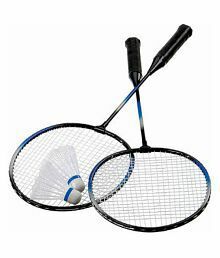 A badminton racquet can be categorised by shape, stiffness, weight, and balance. Mostly all racquets are made of carbon fibre and graphite. Racquets come in two major shapes- Isometric/ square and oval. There are two main types of shuttlecock feathered and plastic. Racquets come in different weights. Generally, a lighter racquet is more manoeuvrable than a heavier one. But a light racquet is also less stable than a heavier one. String tension is a very important factor when choosing a racquet. Beginners should always start with lower tension string on the racquets. Using inappropriate string tension will make the racquet unresponsive and can also cause injury. The grip is the next most important factor when choosing your racquet. A proper grip ensures that there is decent actuation, and feedback to and from the racquet. Towel grips are softer and provide good sweat absorption, but they are more prone to germ accumulation and need to be changed often. Synthetic grips, on the other hand, are less prone to germ accumulation, but not as good as towel grips when it comes to sweat absorption. Whether you are a professional or an amateur badminton player, Snapdeal is the one stop shop you need to look at for all your badminton equipment. From shuttlecocks to grips, racquets to shoes, Snapdeal has it all. Shop Online for badminton racquets and accessories on Snapdeal and get on the winning team! Snapdeal.com - India's best online shopping site - convenient and affordable.